Paper: Sun, D., K.L. Cheney, J. Werminghausen, M.G. Meekan, M.I. McCormick, T.H. Cribb, and A.S. Grutter. 2015. 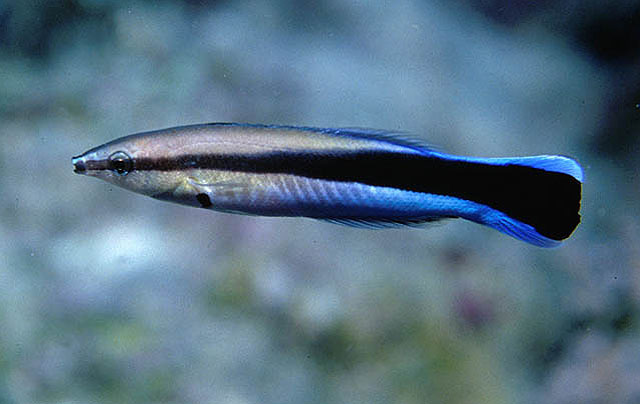 Presence of cleaner wrasse increases the recruitment of damselfishes to coral reefs. Biology Letters 11: 20150456. http://dx.doi.org/10.1098/rsbl.2015.0456. People prefer to live near their friends, right? Maybe my own recent move is influencing how I think about this, but the truth is making new friends is sometimes hard and living on your own isn’t very easy. And I’m not the only one who feels this way. I am anthropomorphizing a bit, but it seems that damselfishes recruiting to coral reefs prefer places where their friend, the cleaner wrasse, lives. It’s a basic question often asked by biologists and ecologists: why do creatures live where they do? The answer to this is incredibly complex and scientists are still figuring out some of the reasons. Most often, the answer falls under physiological reasons (animals adapt to X temperature and Y levels of rainfall) or species interactions (competition and predation, normally). But there’s more to species interactions than just competing and consuming other creatures. Some organisms are involved in relationships that benefit each other: mutualisms! Like competition and predation, mutualisms contribute to community structures by influencing the abundance and distribution of organisms. But how does the presence of the mutualistic partners drive reef community structure? A group of scientists asked just that question. Does the presence of cleaner wrasses on reefs influence damselfish recruitment (settling on the reef)? Or is their presence affecting post-settlement migration behaviors or predation? In other words, do damselfishes settle where they do because their friends are there? Or, do they end up leaving or dying because their friends aren’t there? (A bit morbid, yes). Sun and his colleagues focused on the recruitment aspect in this study. Over the course of 12 years, researchers studied damselfish recruitment in shallow lagoon or back-reef habitats on the Great Barrier Reef in Australia. They surveyed 16 patch reefs for the presence of cleaner wrasse and recruits of damselfish. Some sites were left as controls (the researchers didn’t manipulate anything), but at others, all the cleaner wrasses were removed every three months. During the Australian summer months (November-January) after the new moon, when peak damselfish recruitment occurs, they counted damselfish recruits to these patch reefs. Damselfishes recruited in higher numbers to reefs where cleaner wrasse lived (Fig. 3). There were some species-specific differences in abundance and both common and uncommon species, as groups, followed this trend. Even though there were 31 species of damselfishes that recruited to the 16 reefs, there were no differences between removal and control reefs in damselfish species diversity. Figure 3. a-e) Individual common species of damselfish recruits. f) recruits of uncommon species. White bars indicate control reefs and gray ones show removal reefs. 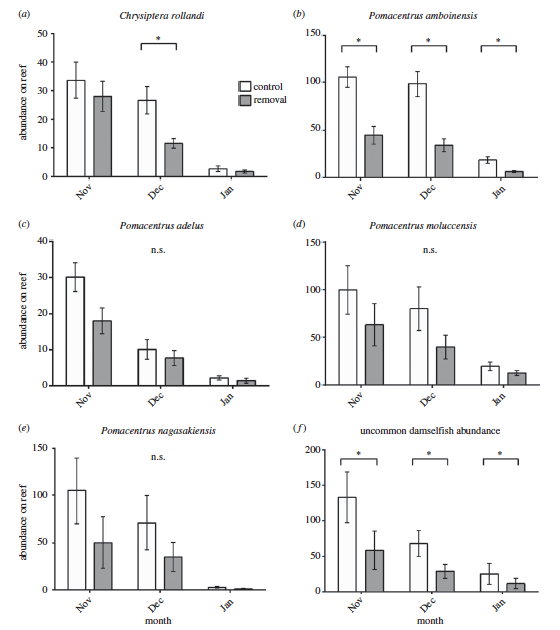 Asterisks indicate statistically significant differences between control and removal reefs. The results of this study are important because they help elucidate why species go where they go. 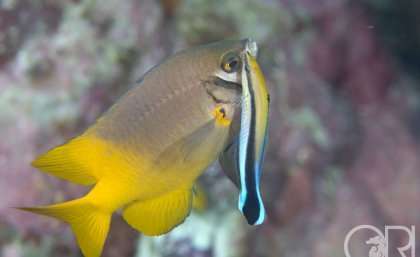 Damselfishes, which are abundant and important members of the coral reef community, are more likely to settle on reefs where cleaner wrasses are present. Therefore, mutualistic relationships are an important component of the complex recruitment process. However, the presence of cleaners didn’t affect the overall diversity of recruits. 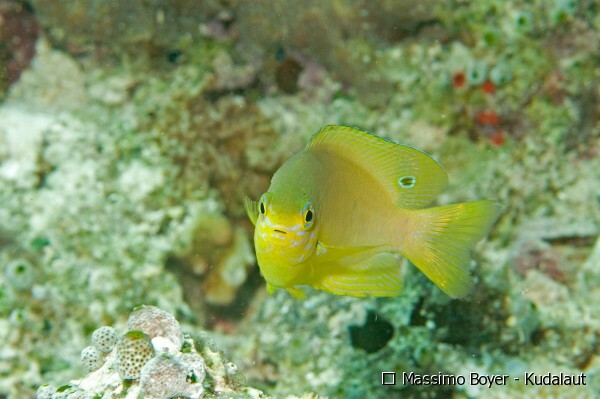 But previous studies have found that damselfish diversity differs between reefs with and without cleaner wrasses. The authors suggest that diversity differences are likely due to that post-settlement migration or mortality from parasitism. This study is also important because it asks more questions that need to be examined. Why do damselfish recruit preferentially to reefs with cleaners? Are they using visual or scent cues to detect cleaners? Can they detect fewer parasites, which will impair their swimming and increase their mortality? Are they honing in on the presence of members of their species as indicators of high quality habitat? More research is necessary to answer these questions, but the answers are sure to be fascinating! Regardless of the answer, we are enriched to simply know more about how nature works. And nature has ruled that the presence of friends is a good reason to live somewhere! If you’re interested in other posts about mutually beneficial relationships among fish, you should check out yesterday’s post!